Knowledge of the immunological events necessary to control hepatitis B virus (HBV) infection has accelerated in recent years, but their translation towards therapeutic strategies able to achieve a durable HBV suppression has been challenging. The scenario of how HBV deals with the host immunity is presented and used to discuss how the immune response can be harnessed to potentially achieve infection control. An efficient control of virus infections requires the coordinate action of both innate and adaptive immune responses. Innate immunity has evolved to rapidly recognise viral nucleic acids, viral proteins and tissue damage. It induces an antiviral state on infected cells by producing type I interferons (IFN), decreases the pool of infected cells by directing natural killer (NK) cell-mediated killing of viral infected cells, and supports the efficient maturation and site recruitment of adaptive immunity through production of pro-inflammatory cytokines and chemokines.1 These mechanisms reduce virus spread until the adaptive branch of immunity takes the stage. Adaptive immunity acts through functional maturation and expansion of distinct B and T cell clones able to specifically recognise the infectious agents, a process that necessitates time. This process leads to the control of infection and generates a memory response which increases the host ability to block subsequent infections with the same pathogens. While most viruses enter a logarithmic phase of propagation immediately after infection (eg, hepatitis C virus (HCV), HIV, human cytomegalovirus (HCMV), influenza virus, dengue virus), HBV infection is characterised by a delayed amplification of HBV replication and spread. Febrile symptoms occur immediately in many acute viral infections, while acute HBV infection is mainly asymptomatic. Finally, while viral persistence is frequently associated with low viral load and protein expression (eg, HCV, HCMV, Epstein–Barr virus), chronic HBV infection is typically characterised by the production of extremely high quantities of viral proteins (HBsAg, HBeAg).3 ,4 We will summarise how HBV deals with host immunity and we will discuss how we can harness the immune response to potentially achieve infection control. Innate immunity against HBV: lack of recognition or active inhibition? Taking into consideration these experimental limitations, an overall scenario of limited or even absent activation of innate immunity seems to be the hallmark of acute HBV infection. Pro-inflammatory cytokines are often undetectable during the early phases of infection (within the first 30 days) in humans infected with HBV and, when present, their production is of lower magnitude and delayed kinetics compared with HCV and HIV infected patients.10 A lack of induction of type I interferons was also seen in a cohort of 21 acute HBV patients, eight of whom were sampled from the inception of the viral expansion phase.11 These observations are in line with the lack of flu-like symptoms experienced by most patients, and support seminal results obtained in HBV infected chimpanzees, showing lack of induction of IFN-related genes during the phase of viral entry and expansion.12 In sharp contrast with these findings, rapid up-regulation of innate response genes was observed in animals infected with HCV,13 clearly indicating how two viruses with identical tropism utilise different strategies in their interaction with the host. Nevertheless, in support of the ability of the innate immunity to sense and react to HBV, a transient though slight activation of IFN-α genes was also detected in human hepatocytes infected by HBV in chimeric mice.20 Unfortunately, the mechanisms responsible for sensing HBV within the infected cells have not been elucidated yet, and which molecular components of the virus—HBV DNA, RNA or viral proteins—are actually recognised by the pattern recognition receptors (PRR) triggering the antiviral response is still undefined. The answer will be most likely found among the growing family of PRR able to discriminate intracellular pathogen DNA.21 In addition to cytosolic DNA receptors, like DAI, RIG-1, DHX9 (helicase) or AIM2 (schematic representation in figure 1), the recent discovery of immune interferon-16 (IFI-16) as an innate immune DNA receptor present in the nucleus is particularly interesting.17 IFI-16 senses the presence of the episomal circular DNA of Kaposi sarcoma-associated herpes virus in the nucleus of infected cells.22 It will be very interesting to test whether such a mechanism can also work in HBV infected cells. Innate immunity against HBV: can HBV suppress the innate immunity? How can we reconcile the opposite evidence of intracellular sensors of innate immunity capable of detecting HBV infection with the substantial weakness of the classical type I IFN/ pro-inflammatory response in acutely HBV infected patients and animal models? To explain such a conundrum, several studies have investigated the possibility that HBV can actively suppress instead of escaping the innate immunity through the action of different viral proteins. Recent work has, for example, shown the potential ability of HBV polymerase to inhibit IFN-β induction by interfering with interferon regulatory factor (IRF) signalling.23 ,24 Mechanistically, polymerase was shown to interact with DDX3, a transcriptional factor of the IFN-β promoter (figure 2).23–30 Since DDX3 acts downstream of the activation cascade triggered either by Toll-like receptor (TLR)-3 (trough TRIF) or by RIG-I (trough IPS-1), the results of these studies show that polymerase can block the activation mediated by these two receptors recognising dsRNA in the endosomes (TLR-3) or in the cytosol (RIG-I). Since the inhibition of IFN-β production mediated by HBV polymerase was obtained in HepG2 cells where the TLR-3 receptor was over-expressed and the TLR-3 and RIG-I triggering was obtained with heterologous inducers (poly I:C for TLR-3 and Sendai virus for RIG-I), caution is necessary in the evaluation of the physiological role of this mechanism. Molecular targets of different hepatitis B virus (HBV) proteins in host innate responses. Induction of intracellular type I IFN-production might be suppressed by HBV polymerase trough DDX-3 interaction23 ,24 or by HBV x protein through down-regulation of the mitochondrial antiviral signalling protein MAV-5.25–27 IFN-α induced response can be blocked by HBV polymerase.28–30 A potential mechanism is the block of STAT-1 nuclear translocation. No data are available on the potential mechanisms responsible for the suggested ability of HBsAg and HBeAg to inhibit innate immune response. Furthermore, the HBV x protein has been reported to actively inhibit the innate immunity (figure 2) by interfering with signalling mediated by the cytosolic sensory molecules (RIG-I, helicases) through interaction with the β interferon promoter stimulator 1 (IPS-1) protein, also known as mitochondrial antiviral signalling (MAVS) protein or virus-induced signalling adaptor (VISA), which is essential for the induction of type I IFN.25–27 Also in these experimental models, intracellular IFN-β production was activated by heterologous inducers (poly dAT:dAT or poly I:C or vescicular stomatitis viruses), RIG-I and IPS-1 were over-expressed in HepG2 cells, while HBx/IPS-1 interaction was detected by over-expressing HBx. All these studies performed on HBV transfected cells are important to reveal potential clues on the interplay between HBV and innate immunity, and suggest that HBV, through its polymerase and x proteins, may affect IFN-β production by interfering at multiple sites of the intracellular signalling triggered by HBV infection. The real efficiency of these inhibitory mechanisms mediated by HBV proteins is however difficult to quantify and it will necessitate the use of a natural infection system. The possibility that the secretory HBV proteins (HBsAg and HBeAg) can interact and modulate the inflammatory liver environment directly or through the induction of immunosuppressive cytokines, such as IL-10, is appealing since it could explain the evolutionary necessity of the virus to produce such a large quantity of secretory proteins. Anti-HBe+ patients manifest more aggressive liver disease, a clinical observation that could reflect the ability of HBeAg to down-modulate the pro-inflammatory liver environment. The production of HBeAg and HBsAg has been historically associated with an ability of the virus to interfere with adaptive immune mechanisms; in support of this, hepatocytes expressing both HBcAg and HBeAg have been reported to be more susceptible to cytotoxic T lymphocytes (CTL)-mediated lysis than hepatocytes expressing only HBcAg, suggesting that precore variants unable to produce HBeAg should have a selection advantage over wild type viruses able to produce both HBcAg and HBeAg.36 An additional effect of the secretory HBV proteins on innate immunity cannot however be dismissed. What role do NK cells play in HBV infection? Even without an appropriate induction of pro-inflammatory cytokines directly triggered by HBV infection, NK cells remain well poised to respond to acute HBV infection in the liver. Hepatocytes express very low levels of MHC class I,38 such that any up-regulation of cellular stress ligands able to engage NK activatory receptors should be able to induce local NK cell effector function. Furthermore, NK cells are extremely abundant in the normal liver, constituting 30–40% of intrahepatic lymphocytes. In chimpanzees, the clearance of HBV infected hepatocytes by adaptive immunity was found to be preceded by an increase in intrahepatic IFN-γ and tumour necrosis factor-α (TNF-α),39 which could be produced by NK cells. However, subsequent experiments showed a critical role for T cells rather than NK cells in HBV control in this model.40 Studies of patients around the time of first detection of surface antigen and HBV-DNA revealed an increase in the number of circulating NK cells,41 ,42 but their activation and effector function was suppressed as viral load increased, and only peaked once viraemia had resolved.11 This inhibition of NK cell activation and effector potential was temporally associated with an induction of IL-10, again raising the possibility that HBV can actively evade immune responses. However, little data are available regarding the involvement of NK cells in the immediate response to infection, and only recent results obtained in woodchucks infected with high WHV dose (1011) show an activation of a gene related to NK cell activation immediately after infection (8–12 h).8 It therefore remains possible that NK cells contribute to HBV control in the earliest lag phase of infection, but such a hypothesis still awaits proper demonstration. As a possible consequence of the limited and transient activation of the innate immunity during primary HBV infection, the mechanisms adopted by HBV to suppress the antiviral and pro-inflammatory effect of the innate immunity, even though present, do not seem to be particularly robust since, for example, exogenous TLR-mediated activation can suppress HBV replication in HBV transgenic mice50 and in HBV transfected HepG2 and Huh7 cells.51 It therefore seems logical, as a therapeutic strategy, to consider the possibility to stimulate the weak innate immune response to improve its antiviral effect. In this respect, the therapeutic efficacy of TLR-receptor stimulation with TLR-agonist has been reported in HBV infected woodchucks52 and chimpanzees.53 To further maximise intrahepatic innate immune activation, strategies to specifically deliver antiviral cytokines to the infected liver or to target activation of intrahepatic Kupffer and NK cells should be explored. The discovery of peptides able to specifically bind hepatocytes54 and the production of antibodies with HBV-infected cell specificity55 might provide the tool to target cytokines and TLR-agonist into the HBV infected liver. Since the potential rapid release of pro-inflammatory cytokines (such as IL-12, IL-18 and TNF-α) might potentially trigger liver cell injury, the study of the effect of cytokines and TLR-receptor activation on the liver microenvironment should be extended to identify the balance between viral control and liver injury and a careful evaluation of new therapies in animal models will be necessary. While the role played by innate responses in initial HBV control is still debated, quality and strength of early adaptive immunity are generally seen as a representative model of the immune response that must be mounted to control a virus infection efficiently. In self-limited infections, HBV-DNA falls by more than 90% within 2–3 weeks after the peak of viral replication and before detection of liver damage, indicating that a large quantity of virus is eliminated without the need of liver cell destruction by non-cytopathic mechanisms sustained by cytokines, including IFN-γ and TNF-α, secreted by CD8 T cells.39 ,58 Intrahepatic recruitment of HBV-specific CTL, that is facilitated by the secretion of chemokines (like CXCL-10) and by platelet activation,59–62 also leads to killing of infected hepatocytes with subsequent recruitment of antigen non-specific cells that amplify hepatocellular damage (which is initially triggered by HBV-specific mechanisms). As predicted by the accepted models of T cell differentiation,63 ,64 when infection is successfully controlled, maturation of T cell memory occurs efficiently, as indicated by the increasing expression of CD127 molecules and the decline of programmed death (PD)-1 on HBV-specific CD8 cells following resolution of infection.65 ,66 This stage is, however, preceded by a functional HBV-specific CD8 T cell impairment which is detectable at the peak of disease when the majority of HBV-specific CD8+ T cells are activated but are poorly able to proliferate and functionally exhausted.11 ,67 This functional decline has been reported to be associated with a peak of IL-10 production,11 but could also be caused by the increased levels of arginase released by dying hepatocytes.68 By depleting the essential amino acid L-arginine, arginase contributes to the down-regulation of the CD3ζ-chain on T cells and thus causes T cell receptor signalling impairment, resulting in the suppression of T cell functions.69 These mechanisms of acute phase suppression can represent a homeostatic process common to many virus infections,70 finalised to avoid excessive immunopathology and to favour T cell contraction. These two combined mechanisms can result in the deletion of HBV-specific T cells or in their functional inactivation (exhaustion), which is characterised by an increased expression of negative co-stimulatory molecules and a dysregulation of co-stimulatory pathways, such as PD-1/PD-L1,65 ,73 ,78 ,79 which affect the quality and intensity of the antiviral T cell response. Lack of T cell help80 can also contribute to the defective functionality of HBV-specific CD8 T cells present in chronic patients. Other mechanisms, like impairment of T cell receptor signalling by CD3ζ-chain down-regulation69 and enhanced T cell apoptosis caused by Bcl2-interacting mediator (bim) up-regulation80 also contribute to alter the T cell function. Interestingly, addition of L-arginine can restore CD3ζ expression and can improve T cell function.69 Since L-arginine depletion due to increased arginase release is more pronounced during liver inflammation,68 the metabolic conditions of the liver microenvironment can contribute to further modulate the already altered HBV-specific T cell function in chronic HBV patients. What is the role of these specific families of T cells during hepatitis B? Many studies have shown that Treg, Th17 and Th22 cell frequencies are higher in patients with chronic hepatitis than in healthy subjects.84–87 T cell populations able to produce IL-17 and IL-22 are often enriched in the intrahepatic environment and can carry CD161 and CXCR-6 receptors, a phenotypic profile that is enriched in tissue-homing T cells.88 These correlations do not however clarify the role of such cells in the pathogenesis of HBV infection. Treg cells can suppress, at least in vitro, HBV-specific T cell functions,86 ,89 but such an effect is also observed in patients that are perfectly able to control the virus.90 Furthermore, Treg frequency is correlated to ALT levels,86 suggesting that Treg might preferentially have an anti-inflammatory effect without playing a role in HBV persistence. It is currently unknown what the necessary stimulus is to trigger T cell production of IL-17 and IL-22 during HBV infection. Even though HBV-specific IL-17 producing cells were initially reported,85 more recent data failed to detect IL-17-producing HBV-specific T cells in acute and chronic HBV patients, both in the periphery and in the intrahepatic environment.92 In contrast, HBV-specific T cells maturing in the intrahepatic inflammatory environment can produce CXCL-8 (IL-8),92 a cytokine that has a pro-inflammatory effect93 and that can contribute to the development of liver pathology through the recruitment of granulocytes.94 Overall, with the exception of some interesting correlative analysis, we are far from having a clear understanding of the impact that T cells with regulatory, pro-inflammatory and hepatoprotective effects have on the control of HBV infection and on the pathogenesis of chronic viral hepatitis. Although such cells are not HBV-specific, they should theoretically play an important role in the modulation of liver inflammation during viral hepatitis; thus, they deserve a better characterisation since modulation of their effect may be exploited for future immunotherapies. The functional alterations of virus-specific immunity in chronic hepatitis B patients suggest that their functional restoration could result in the resolution of infection. Antigen persistence is a major factor driving the functional alteration of HBV-specific T cells, and thus antigen removal to allow T cell resting can be an essential requirement for the functional reconstitution of antiviral T cell responses.2 ,63 ,95 To what extent is the virus-specific T cell dysfunction reversible in chronic active infections? Control of virus replication in chronic hepatitis B by antiviral therapy can induce only a partial improvement of the T cell function. In most cases such limited recovery can be explained because high concentrations of HBV envelope antigens remain detectable for long time after HBV-DNA suppression. Therefore, it is not surprising that IFN-α therapy cannot restore an efficient antiviral T cell response in the peripheral blood of naïve anti-HBe+ patients with chronic hepatitis B during the first 6 months of therapy (personal communication), despite its known modulatory function on the immune system. In line with this interpretation, a late effect of IFN therapy on proliferative HBV-specific T cell responses has been reported by Sprengers et al 97 and Carotenuto et al,98 who observed significant differences between responder and non-responder patients only during the final weeks of therapy (between weeks 44 and 56). Similar results were reported recently in a cohort HBeAg positive tolerant children with infancy-acquired HBV infection.99 Restoration of HBV-specific T cell responses (both CD4 and CD8) in lamivudine treated HBeAg+ highly viraemic patients is also transient,100–102 and recent studies in nucleoside/nucleotide analogue (NUC) treated anti-HBe+ chronic active hepatitis patients with persistent suppression of HBV replication indicate that despite a gradual and persistent recovery of HBV-specific T cell functions proportional to the HBsAg decline, such recovery remains frequently incomplete even when HBsAg clearance and anti-HBs antibody production are achieved (personal communication). If antigen reduction is not sufficient to obtain a robust functional recovery, it is likely that additional strategies that directly target the activation defects of HBV-specific T cells should be implemented to achieve a full HBV-specific T cell recovery (summarised in table 1).50–53 ,65 ,73 ,78 ,79 ,100–109 One strategy is to directly target the negative co-stimulatory pathways involved in the pathogenesis of T cell exhaustion. Among the different co-stimulatory molecules, PD-1 is highly expressed on HBV-specific T cells,65 ,73 ,78 ,79 especially within the liver,73 and the effect of PD-1/PD-L1 blocking by anti-PD-L1 antibodies has been reported to be greater on intrahepatic than on peripheral T cells in chronic HBV infection.73 Importantly, different co-stimulatory pathways that have been analysed more thoroughly in human HIV and HCV infections as well as in different animal models of chronic viral infection, including CD137/CD137L, CTLA4/CD86-80, CD27/CD70, CD40/CD40L, CD134/CD134L, CD160/HVEM complex, 2B4/CD48, CD223-LAG3/class II MHC and TIM-3/GALECTIN 9 phosphatidyl serine, seem to be non-redundant in the pathogenesis of T cell exhaustion.110 Based on this, recent studies have been devoted to assess whether combined blockade or stimulation of different receptor/ligand interactions can be synergistic in restoring the HBV-specific T cell function. Thus, the co-inhibitory 2B479 and cytotoxic T lymphocyte antigen-4 (CTLA-4)78 and the co-stimulatory CD137 (personal communication) pathways were tested alone or in combination with PD-1/PD-L1 blockade to optimise functional T cell restoration. Results indicate that the effect of these pathways on HBV-specific T cell exhaustion is non-redundant, with patients responding better to manipulation of one or another pathway and some responding better to combined manipulation. This is promising in the perspective of novel strategies of immunotherapy, but understanding better how different regulatory pathways can act and synergise is essential for the design of immunotherapies able to act selectively on the inhibitory mechanisms directed against HBV-specific responses, avoiding the risks related to generalised reconstitutions of T cells of different specificities.110 In this respect, stimulation of molecules which are selectively up-regulated on activated T cells, such as CD137,111 may be of particular interest as an adjuvant strategy to apply in combination with HBV-specific T cell stimulation, for example with anti-HBV vaccines. In conclusion, the increased knowledge of the innate and adaptive immunity during viral hepatitis B has led to the development of new approaches designed to trigger the defective innate immunity or to restore the exhausted adaptive immunity that characterise this infection (figure 3). 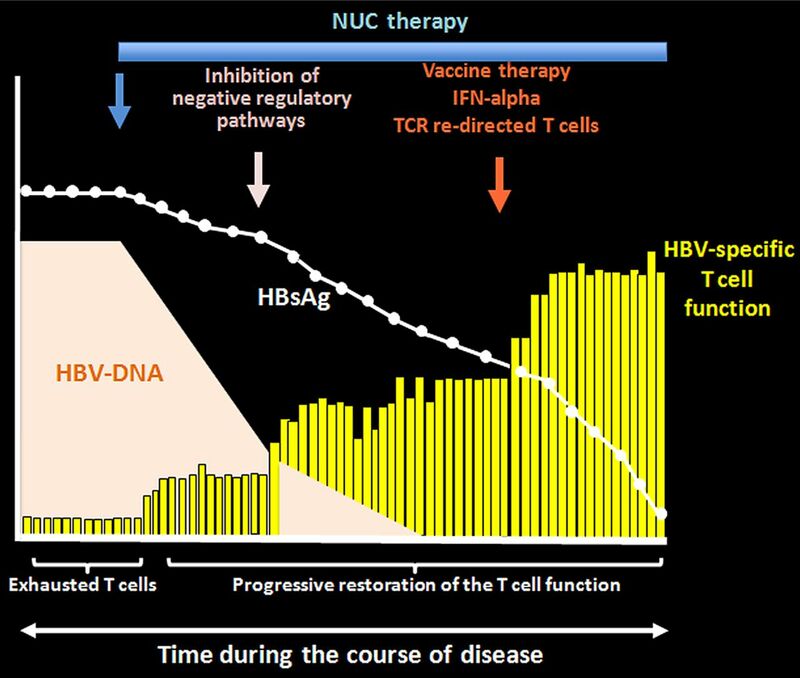 Some of the sophisticated methods based on reconstitution of HBV-specific T cell immunity through T cell receptor transfer,108 ,114 the use of human monoclonal antibodies targeting HBV infected cells55 or blocking pro-apoptotic pathways to bypass the HBV-specific T cell defects,107 are technically too complex to be implemented, but others, like the use of TLR agonists,50–53 are likely to be tested soon in clinical trials. Current antivirals will continue to be the standard of care for the foreseeable future due to their efficacy and affordability. However, their substantial inability to achieve HBV clearance or sustained HBV control after therapy interruption, and the potential threat of selecting HBV variants,116 advocate their association with new therapeutic strategies aimed at boosting immune-mediated viral control. How to apply immunomodulation of T cell responses to hepatitis B virus (HBV) therapy in practice? Since T cells in chronic active hepatitis B are exhausted and a primary cause of this condition is their persistent exposure to high antigen doses, the first goal of therapy should be to restore the antiviral T cell function by inducing a decline of antigenaemia with nucleoside analogues. This may be not sufficient and it may need to be implemented with additional strategies to improve protective immune responses, by manipulating negative co-stimulatory pathways involved in the pathogenesis of T cell exhaustion, such as PD1, or suppressive cytokines, such as IL-10 or TGF-β, or inhibitory Treg cells. Once restoration of T cell responsiveness has been at least partially achieved, other immunostimulatory compounds, such as IFN-α or anti-HBV vaccines, which would be most likely ineffective in naïve patients because of functional T cell paralysis, should acquire optimal stimulatory capacity and should thus be considered in order to achieve complete virus control. As an alternative, the overall antiviral T cell function could be improved by engineering fully functional autologous T cells to render them capable of recognising virus infected cells without suffering from the inhibitory effect of the host environment. Both approaches can run the risk of inducing severe liver pathology if the quantity of antigen and the number of infected liver cells is high; for this reason, all these strategies should be applied when HBV replication is persistently suppressed and when HBsAg levels have already consistently declined under nucleoside analogue therapy. Better understanding of the different aspects of HBV pathogenesis has provided the rationale to modulate immunity with the goal of achieving long-lasting control of HBV. This is therefore a stimulating time for scientists and clinicians who will embrace the challenge to design and test new therapies based on the rational combinations of antiviral and immunomodulatory compounds. We wish to thank the staff of the Viral Hepatitis Laboratory, Singapore Institute for Clinical Sciences, and Unit of Infectious Diseases and Hepatology, Azienda Ospedaliero-Universitaria di Parma for their help and comments. We regret that many important papers could not be cited due to space constraints.
. Pathogen recognition and innate immunity. Cell 2006;124:783–801.
. The host-pathogen interaction during HBV infection: immunological controversies. Antiviral Ther 2010;15:15–24.
. Stealth and cunning: hepatitis B and hepatitis C viruses. J Virol 2005;79:9369–80.
. Kinetics of the immune response during HBV and HCV infection. Hepatology 2003;38:4–13.
. Infection of a human hepatoma cell line by hepatitis B virus. Proc Natl Acad Sci U S A 2002;99:15655–60.
. Persistence of the hepatitis B virus covalently closed circular DNA in HepaRG human hepatocyte-like cells. J Gen Virol 2009;90:127–35.
. The woodchuck: an animal model for hepatitis B virus infection in man. Intervirology 1995;38:100–12.
. Intrahepatic expression of genes affiliated with innate and adaptive immune responses immediately after invasion and during acute infection with woodchuck hepadnavirus. J Virol 2008;82:8579–91.
. Repopulation of mouse liver with human hepatocytes and in vivo infection with hepatitis B virus. Hepatology 2001;33:981–8.
. Induction of a striking systemic cytokine cascade prior to peak in acute human immunodeﬁciency virus type 1 infection, in contrast to more modest and delayed responses in acute hepatitis B and C virus infections. J Virol 2009;83:3719–33.
. Temporal analysis of early immune responses in patients with acute hepatitis B virus infection. Gastroenterology 2009;137:1289–300.
. Genomic analysis of the host response to hepatitis B virus infection. Proc Natl Acad Sci U S A 2004;101:6669–74.
. Genomic analysis of the host response to hepatitis C virus infection. Proc Natl Acad Sci U S A 2002;99:15669–74.
. Innate response to hepatitis B virus infection: observations challenging the concept of a stealth virus. Hepatology 2009;50:1692–5.
. Control of hepatitis B virus replication by innate response of HepaRG cells. Hepatology 2010;51:63–72.
. Not Interferon, but interleukin-6 controls early gene expression in hepatitis B virus infection. Hepatology 2009;50:1773–82.
. Innate DNA sensing moves to the nucleus. Cell Host Microbe 2011;9:351–3.
. The size of the viral inoculum contributes to the outcome of hepatitis B virus infection. J Virol 2009;83:9652–62.
. Persistence of infectious hepadnavirus in the offspring of woodchuck mothers recovered from viral hepatitis. J Clin Invest 1999;104:203–12.
. Hepatitis B virus limits response of human hepatocytes to interferon-α in chimeric Mice. Gastroenterology 2011;140:2074–83.
. Innate immune sensing of DNA. PLoS Pathog 2011;7:e1001310.
. IF I16 acts as a nuclear pathogen sensor to induce the inflammasome in response to Kaposi Sarcoma-associated herpesvirus infection. Cell Host Microbe 2011;9:363–75.
. Hepatitis B virus polymerase blocks pattern recognition receptor signalling via interaction with DDX3: implications for immune evasion. PloS Pathog. Published Online First: 15 July 2010. doi:e1000986.
. Hepatitis B virus polymerase inhibits RIG-I- and Toll-like receptor 3-mediated beta interferon induction in human hepatocytes through interference with interferon regulatory factor 3 activation and dampening of the interaction between TBK1/IKKepsilon and DDX3. J Gen Virol 2010;91:2080–90.
. The hepatitis B virus X protein disrupts innate immunity by downregulating mitochondrial antiviral signalling protein. J Immunol 2010;185:1158–68.
. Hepatitis B virus regulatory HBx protein binds to adaptor protein IPS-1 and inhibits the activation of beta interferon. J Virol 2011;85:987–95.
. Hepatitis B virus X protein suppresses virus-triggered IRF3 activation and IFN-beta induction by disrupting the VISA-associated complex. Cell Mol Immunol 2010;7:341–8.
. Inhibition of alpha interferon signaling by hepatitis B virus. J Virol 2007;81:159–65.
. Hepatitis B virus polymerase inhibits the interferon-inducible MyD88 promoter by blocking nuclear translocation of Stat1. J Gen Virol 2007;88:3260–9.
. Expression of the terminal protein region of hepatitis B virus inhibits cellular responses to interferons alpha and?gamma and double stranded RNA. Proc Natl Acad Sci U S A 1991;88:2888–92.
. Interferon signaling and treatment outcome in chronic hepatitis C. Proc Natl Acad Sci U S A 2008;105:7034–9.
. Hepatitis B and C virus coinfection: a novel model system reveals the absence of direct viral interference. Hepatology 2009;50:46–55.
. Peginterferon alfa-2a plus ribavirin for the treatment of dual chronic infection with hepatitis B and C viruses. Gastroenterology 2009;136:496–504.
. Hepatitis B virus suppresses toll-like receptor-mediated innate immune responses in murine parenchymal and nonparenchymal liver cells. Hepatology 2009;49:1132–40.
. Regulation of toll-like receptor-2 expression in chronic hepatitis B by the precore protein. Hepatology 2007;45:102–10.
. A mechanism to explain the selection of the hepatitis e antigen-negative mutant during chronic hepatitis B virus infection. J Virol 2009;83:1379–92.
. NK cells and NKT cells in innate defense against viral infections. Curr Opin Immunol 2001;13:458–64.
. The level of viral antigen presented by hepatocytes influences CD8 T-cell function. J Virol 2007;81:2940–9.
. Viral clearance without destruction of infected cells during acute HBV infection. Science 1999;284:825–9.
. CD8(+) T cells mediate viral clearance and disease pathogenesis during acute hepatitis B virus infection. J Virol 2003;77:68–76.
. Incubation phase of acute hepatitis B in man: dynamic of cellular immune mechanisms. Hepatology 2000;32:1117–24.
. Early kinetics of innate and adaptive immune responses during hepatitis B virus infection. Gut 2009;58:974–82.
. Cytokines induced during chronic hepatitis B virus infection promote a pathway for NK cell-mediated liver damage. J Exp Med 2007;204:667–80.
. Natural killer cell functional dichotomy in chronic hepatitis B and chronic hepatitis C virus infections. Gastroenterology 2009;137:1151–60.
. Blockade of immunosuppressive cytokines restores NK cell antiviral function in chronic hepatitis B virus infection. Plos Pathog 2010;6:e1001227.
. Hypercytolytic activity of hepatic natural killer cells correlates with liver injury in chronic hepatitis B patients. Hepatology 2011;53:73–85.
. Interferon-alpha-induced TRAIL on natural killer cells is associated with control of hepatitis C virus infection. Gastroenterology 2010;138:1885–97.
. TLR-dependent cross talk between human Kupffer cells and NK cells. J Exp Med 2008;205:233–44.
. A longitudinal analysis of innate and adaptive immune profile during hepatic flares in chronic hepatitis B. J Hepatol 2010;52:330–9.
. Toll-like receptor signaling inhibits hepatitis B virus replication in vivo. J Virol 2005;79:7269–72.
. Activation of pattern recognition receptor-mediated innate immunity inhibits the replication of hepatitis B virus in human hepatocyte-derived cells. J Virol 2009;83:847–58.
. Anti-viral efficacy and induction of an antibody response against surface antigen with the TLR7 agonist GS-9620 in the woodchuck model of chronic HBV infection. J Hepatol 2011;54(Suppl 1):S441. Abstract 1114.
. Therapeutic efficacy of the TLR7 agonist GS-9620 for HBV chronic infection in chimpanzees. J Hepatol 2011;54:S45.
. Prevention of hepatitis B virus infection in vivo by entry inhibitors derived from the large envelope protein. Nat Biotechnol 2008;26:335–41.
. Targeting hepatitis B virus-infected cells with a T-cell receptor like antibody. J Virol 2011;85:1935–42.
. Kinetics of acute hepatitis B virus infection in humans. J Exp Med 2001;193:847–54.
. Immunology of hepatitis B virus and hepatitis C virus infection. Nat Rev Immunol 2005;5:215–29.
. Treatment with HMGB1 inhibitors diminishes CTL-induced liver disease in HBV transgenic mice. J Leukoc Biol 2007;81:100–7.
. MMPs are required for recruitment of antigen-nonspecific mononuclear cells into the liver by CTLs. J Clin Invest 2004;113:1158–67.
. Platelets mediate cytotoxic T lymphocyte-induced liver damage. Nat Med 2005;11:1167–9.
. HBV pathogenesis in animal models: recent advances on the role of platelets. J Hepatol 2007;46:719–26.
. Characterization of hepatitis B virus (HBV)-specific T-cell dysfunction in chronic HBV infection. J Virol 2007;81:4215–25.
. Expression of the interleukin-7 receptor alpha chain (CD127) on virus-specific CD8+ T cells identifies functionally and phenotypically defined memory T cells during acute resolving hepatitis B virus infection. J Virol 2006;80:3532–40.
. Contribution of herpesvirus specific CD8 T cells to anti-viral T cell response in humans. PLoS Pathog. Published Online First: 19 August 2011. doi:e1001051.
. Regulation of human lymphocyte function by a soluble extract from normal human liver. J Immunol 1978;121:1279–86.
. Functional skewing of the global CD8 T cell population in chronic hepatitis B virus infection. J Exp Med 2008;205:2111–24.
. Virus-induced transient immune suppression and the inhibition of T cell proliferation by type I interferon. J Virol 2011;85:5929–39.
. Longitudinal analysis of CD8+ T cells specific for structural and nonstructural hepatitis B virus proteins in patients with chronic hepatitis B: implications for immunotherapy. J Virol 2004;78:5707–19.
. The role of virus-specific CD8 cells in viral control and liver damage during persistent hepatitis B virus infection. J Exp Med 2000;191:1269–80.
. Antiviral intrahepatic T-cell responses can be restored by blocking programmed death-1 pathway in chronic hepatitis B. Gastroenterology 2010;138:682–93.
. Hepatocytes induce functional activation of naïve CD8 T lymphocytes but fail to promote survival. Eur J Immunol 1998;28:221–36.
. The site of primary T cell activation is a determinant of the balance between intrahepatic tolerance and immunity. J Clin Invest 2004;114:701–12.
. Liver antigen presenting cells. J Hepatol 2011;54:357–65.
. Murine hepatic stellate cells Veto CD8 T cell activation by a CD54-dependent mechanism. Hepatology 2011:54:262–72.
. Role of the coinhibitory receptor cytotoxic T lymphocyte antigen-4 on apoptosis-Prone CD8 T cells in persistent hepatitis B virus infection. Hepatology 2011;53:1494–50.
. The immunoregulatory role of CD244 in chronic hepatitis B infection and its inhibitory potential on virus-specific CD8+ T-cell function. Hepatology 2010;52:1934–47.
. Immune effectors required for hepatitis B virus clearance. Proc Natl Acad Sci U S A 2010;107:798–802.
. Mechanisms underlying lineage commitment and plasticity of helper CD4+ T cells. Science 2010;327:1098–102.
. Interleukin-22 but not interleukin-17 provides protection to hepatocytes during acute liver inflammation. Immunity 2007;27:647–59.
. An IL-13 inhibitor blocks the development of hepatic fibrosis during a T-helper type 2–dominated inflammatory response. J Clin Invest 1999;104:777–85.
. Association of CD4+CD25+Foxp3+ regulatory T cells with chronic activity and viral clearance in patients with hepatitis B. Int Immunol 2007;19:133–40.
. Interleukin-17-producing CD4(+) T cells increase with severity of liver damage in patients with chronic hepatitis B. Hepatology 2010;51:81–91.
. Circulating and liver resident CD4+CD25+ regulatory T cells actively influence the antiviral immune response and disease progression in patients with hepatitis B. J Immunol 2006;177:739–47.
. Analysis of CD161 expression on human CD8+ T cells defines a distinct functional subset with tissue-homing properties. Proc Natl Acad Sci U S A 2010;107:3066–11.
. Regulatory T cells contribute to the impaired immune response in patients with chronic hepatitis B virus infection. Hepatology 2005;41:771–8.
. Modulation of the CD8+-T-cell response by CD4+ CD25+ regulatory T cells in patients with hepatitis B virus infection. J Virol 2005;79:3322–8.
. A proinflammatory role for interleukin-22 in the immune response to hepatitis B virus. Gastroenterology. Published Online First: 25 June 2011. doi:10.1053/j.gastro.2011.06.051.
. Licensing virus-specific T cells to secrete the neutrophil attracting chemokine CXCL-8 during hepatitis B virus infection. PloS One 2011;6:e23330.
. Interleukin-8 is activated in patients with chronic liver diseases and associated with hepatic macrophage accumulation in human liver fibrosis. PLoS One 2011;6:e21381.
. Depletion of neutrophils blocks the recruitment of antigen-nonspecific cells into the liver without affecting the antiviral activity of hepatitis B virus-specific cytotoxic T lymphocytes. Proc Natl Acad Sci U S A 2002;99:13717–22.
. Low CD8 T-cell proliferative potential and high viral load limit the effectiveness of therapeutic vaccination. J Virol 2005;79:8960–8.
. Comparison of immune restoration in early versus late alpha interferon therapy against hepatitis C virus. J Virol 2010;84:10429–35.
. Induction of regulatory T cells and interleukin-10-producing cells in non-responders to pegylated interferon-alpha therapy for chronic hepatitis B. Antivir Ther 2007;12:1087–96.
. In-vitro use of autologous dendritic cells improves detection of T cell responses to hepatitis B virus (HBV) antigens. J Med Virol 2009;81:332–9.
. Immune and viral profile from tolerance to hepatitis B surface antigen clearance: a longitudinal study of vertically hepatitis B virus-infected children on combined therapy. J Virol 2011;85:2416–28.
. Lamivudine treatment can restore T cell responsiveness in chronic hepatitis B. J Clin Invest 1998;102:968–75.
. Lamivudine treatment can overcome cytotoxic T cell hyporesponsiveness in chronic hepatitis B: new perspective for immune therapy. Hepatology 2001;33:963–71.
. Transient restoration of anti-viral T cell responses induced by lamivudine therapy in chronic hepatitis B. J Hepatol 2003;39:595–605.
. Interleukin-10 determines viral clearance or persistence in vivo. Nat Med 2006;12:1301–9.
. Resolution of a chronic viral infection after interleukin-10 receptor blockade. J Exp Med 2006;203:2461–72.
. TGF-beta to the rescue. Immunity 2010;32:585–7.
. Mechanisms of foxp3+ T regulatory cell-mediated suppression. Immunity 2009;30:636–45.
. Bim-mediated deletion of antigen-specific CD8 T cells in patients unable to control HBV infection. J Clin Invest 2008;118:1835–45.
. Engineering virus-specific T cells that target HBV infected hepatocytes and hepatocellular carcinoma cell lines. J Hepatol 2011;55:103–10.
. Hepatitis B virus as a gene delivery vector activating foreign antigenic T cell response that abrogates viral expression in mouse models. Hepatology 2009;50:1380.
. The molecular basis of the failed immune response in chronic HBV: therapeutic implications. J Hepatol 2010;52:616–19.
. Immune regulation by 4-1BB and 4-1BBL: complexities and challenges. Immunol Rev 2009;229:192–215.
. IL-21 is pivotal in determining age-dependent effectiveness of immune responses in a mouse model of human hepatitis B. J Clin Invest 2011;121:1154–62.
. Therapeutic vaccination and novel strategies to treat chronic HBV infection. Expert Rev Gastroenterol Hepatol 2009;3:561–9.
. T cells redirected against hepatitis B virus surface proteins eliminate infected hepatocytes. Gastroenterology 2008;134:239–47.
. Gene therapy with mouse and human T cell receptor mediates cancer regression and targets normal tissue expressing cognate antigens. Blood 2009;114:535.
. Efficacy of hepatitis B vaccine against antiviral drug-resistant hepatitis B virus mutants in the chimpanzee model. Hepatology 2009;49:1483–91.
. Reactivation of hepatitis B virus replication in patients receiving cytotoxic therapy. Report of a prospective study. Gastroenterology 1991;100:182–8.
. Hepatitis B associated liver failure following bone marrow transplantation. J Hepatol 1997;27:572–7.
. Use of famciclovir to prevent HBV reactivation in HBsAg-positive recipients after allogeneic bone marrow transplantation. J Hepatol 1998;28:359–68.
. Lamivudine therapy for prevention of immunosuppressive-induced hepatitis B virus reactivation in hepatitis B surface antigen carriers. Blood 2002;100:391–6. Funding Fondazione Cassa di Risparmio di Parma, Italy, by an FIRB grant from the Italian Ministry of the University and Research, Protocol RBAP10TPXK and by a programme grant of the Agency of Science Technology and Research (A*STAR), Singapore.